Up until recently, I was probably the only fifty-something year old woman that had never seen the movie "Breakfast at Tiffany’s." I always knew the movie was a romantic love story, but I had no idea that Audrey Hepburn played such a little boozer party girl in this movie. Last week I had some alone movie time to myself and decided to check out the selections on Netflix. “Breakfast at Tiffany’s” was one of the selections. It's crazy that I had let this famous and classic movie slip through the cracks all these years. I love old movies. There's something nostalgic about the Hollywood style and beauty of women from the 50's and 60's era. I find these old movies captivating and glamorous. It’s very interesting to watch the movies from this generation where both men and women were essentially having cocktails at all hours of the day and smoking cigarettes during any random situation. Also, no one ever seemed to work. They conducted "work" in smoke filled martini lounges and looked beautiful while doing it. Then add to that, a little shaken and not stirred romantic story and you've got a great chick flick. Naturally, the movie starts with boy meets girl then girl flirts with boy. Their romance becomes a cat and mouse game, which ultimately turns into a tumultuous love affair. The sweetness of their newfound love takes them on a morning walk-about in New York City to do things they had never done before. They were on a romantic love discovery; learning about each other. 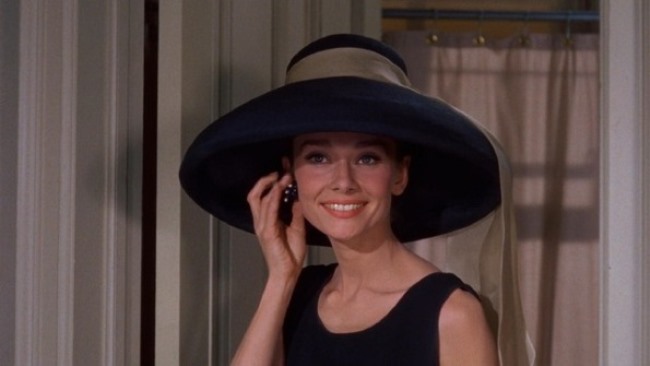 Holly (Audrey Hepburn) discovered the public library for the first time, which was Paul’s favorite spot and Paul (George Peppard) discovered New York’s famed Tiffany's jewelry store, as this was Holly’s favorite getaway. I guess it was a Love Epiphany at Tiffany's. When I thought about it this way, isn’t that what makes being part of a couple so interesting. The other person can bring new ideas and interests into your life organically without even realizing what’s happening. Mister O is an outdoors guy and likes camping, fishing, and canoeing. When we first started dating, I hadn’t expected that I’d be doing more camping and fishing than I had ever done in my whole life. I caught my first walleye with my husband and took my first canoe trip in the early days of our relationship. I'm sure every new romance starts out this way with new experiences and adventures. But, as the years of marriage bliss ticks on, sometimes it becomes more about work, kids and the same old daily routines. Nevertheless, it's still important to KEEP discovering new things as a couple. Mister O likes to take late night swims in the nearby lake and really wants me to take these late night dips with him. I'm not a fan of lake swimming. Don't get me wrong, I've gone swimming before and even done the illicit skinny dipping in my younger years. Unfortunately, after a horrifying experience with a leech and a tangle with some seaweed, it has kept me firmly planted on the beach of the lake and not swimming in it. Maybe one day I'll surprise him and join him under the moonlight. It does sound romantic, but I can't get past the giant leeches that may be lurking beneath. Sometimes just doing different things out of the norm and yet keeping it simple can ignite romance like those of an old Hollywood movie. One Sunday morning, I suggested around 8 a.m. that we hop on our bikes and ride up to McDonald’s for breakfast. It’s a choice that was close enough for simple and easy, but far enough away for a decent bike ride. I thought it’d be something different from our usual Sunday morning routine. Of course, it wasn’t a fancy champagne brunch and we both have had our share of McDonald’s breakfast in the past, typically by grabbing it drive-thru style. 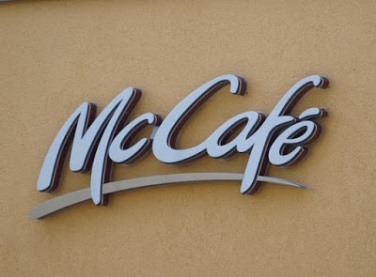 So, riding our bikes to McCafe for an eat-in Sunday morning breakfast was definitely a change-up. In fact, Mister O mentioned it was his first time having the full McD's pancake breakfast instead of the on-the-run Egg McMuffin. How about that...it may seem nutty, but we actually succeeded at having an offbeat interlude. Strangely, it was at McDonald’s of all places. Afterwards, we had a cool and crisp, but enjoyable September bike ride back home. It was a spontaneous early morning jaunt with just the two of us. Now, when looking back, I realized we had a "Breakfast at Tiffany's" moment. Except ours was Breakfast at McDonald's! That’s right, something impulsive with a little a dash of romance; just like a Hollywood movie. Seriously, you can turn any moment into a Hollywood movie. You just have to have some imagination. I suppose since he did the whole bike ride and McCafe breakfast with me, now it's my turn to humor him with a moonlight swim. If I do, I'll only go piggy back with my legs clamped around his waist. I, by no means, want to do any toe touching on the lake's bottom where leeches may be creeping and latching onto my feet. Making romance movies isn't as easy and glamorous as it may look. It’s not always about smoke-filled martini lounges with beautiful women in gorgeous dresses and jewels. Sometimes it's just a bike ride in sweats and tennis shoes to McDonald’s. Or, it’s possibly hitching a ride on hubby's back for a moonlight swim. Minus the leeches! Are you having your romantic "Breakfast at Tiffany's" movie moments? If not, start at McDonalds! I hear they’re extending breakfast hours. I love to do stuff like that although here lately we don't get a lot of alone time with momma living here. We've been talking about getting bicycles and this is just another reason why it's a good idea for us. We do a lot of canoeing and camping as well and my trick for lake swimming is to wear an old lightweight pair of tennis shoes into the water. It makes it so much better not having to touch the icky bottom with my feet! Although if your skinny dipping that might now work out to well haha! I'm with you about swimming in the dark... or a lake if it's not clear. I want to know what's in there with me! Yes, spontaneous things like swimming and bike riding are essentials to keeping even the best of relationships from getting into a rut. You make me want to watch this movie, have a cocktail, a cigarette, some hanky panky, and an Egg McMuffin. LOL. Molly, so funny! Hope you make a weekend of doing all of this. Thanks for commenting. How sweet. I never thought of it this way, but my husband and I have had many of these wonderful moments. I think it is because at the time you are both caught up in just being together and enjoying each other - all the external environmental things seem to be present just for the two of you.